Is there a particular area you haven’t found the perfect decoration for? Have you gotten a little too used to that picture you’ve been using as a temporary filler? Has your search for just the right art to express the character of your home or office been in vain? Or did you ever find something you did like, but then it wasn’t the right size? It’s not always easy to find the artwork you love, that truly compliments a particular setting. 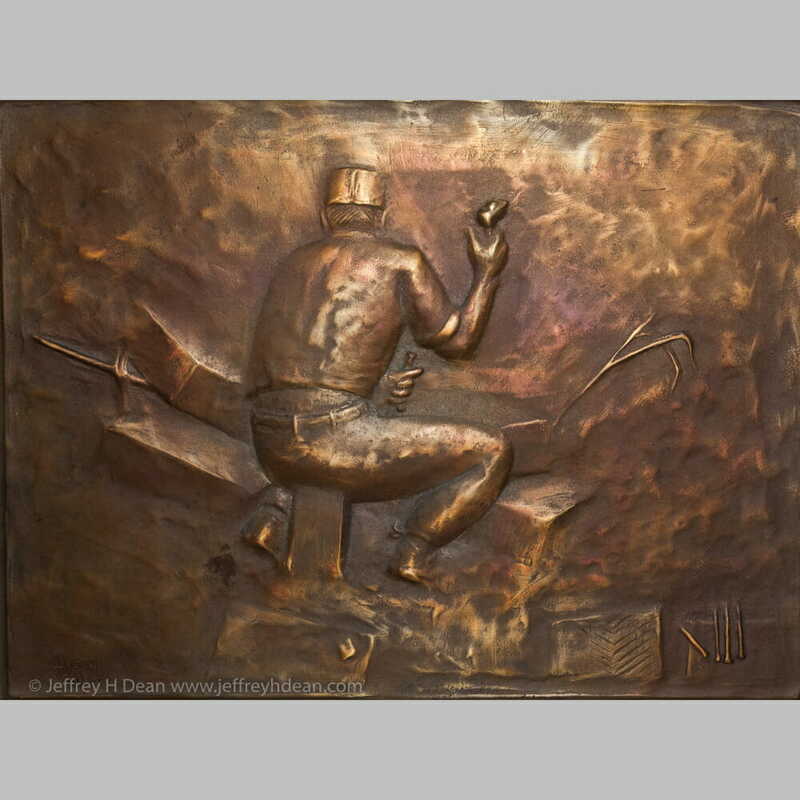 I’ve been making both decorative and functional sculpture and wall art for over 36 years. 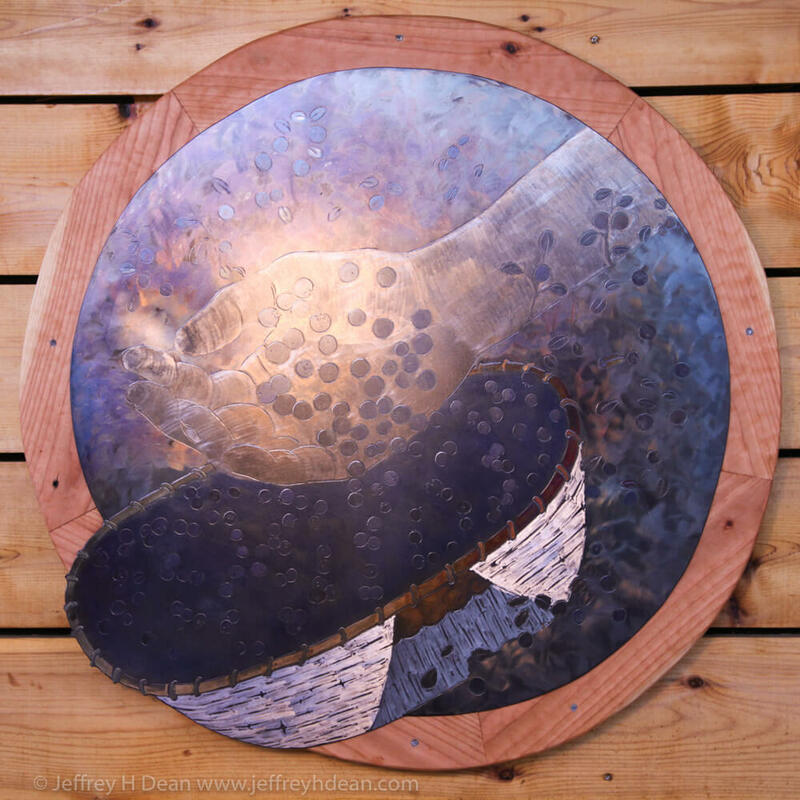 From my first decorative heat shield to my latest Percent for Arts Commission, I’ve got over 80 commissions under my belt. As the testimonials below confirm, I feel confident I can create a work of art that you’ll be honored to pass along through the generations. What can you imagine for your own setting? As an artist, I can’t help but get excited when presented with a new commission setting. Combinations of materials, techniques and subject matter all begin to take form in my mind. This begins with a general feeling of what would go well in the space and continues to develop through interaction with my client, contemplation, design work, and the odd flash of inspiration. Many of my pieces are designed for their specific setting. This pierced cherry mantle and open relief were inspired by the shapes in the beautiful masonry fireplace. It was designed to compliment, rather than hide the rockwork. Different locations offer unique opportunities. This large, layered wall piece was made for a recessed shelf. 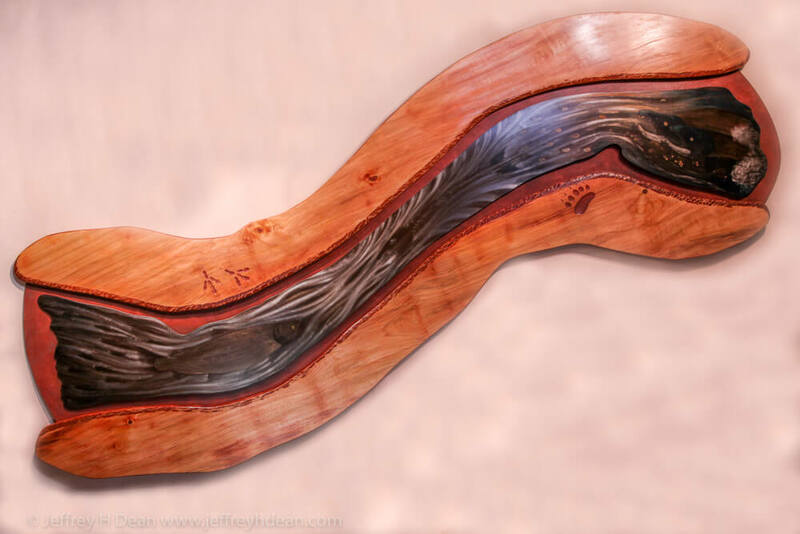 I formed the stream into an S-curve to flow out and over the edge of the shelf. 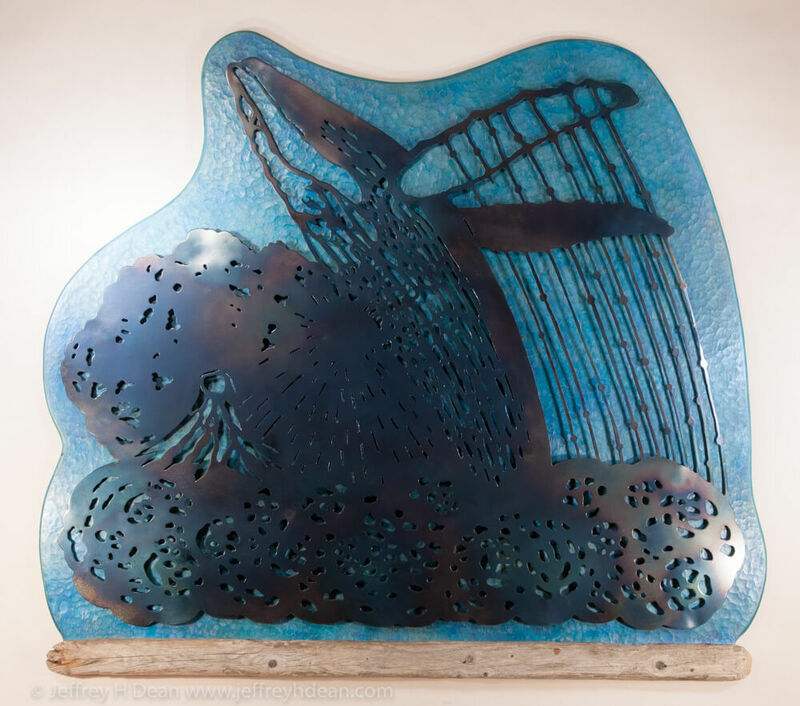 This relief sculpture was also designed with a specific maple slab in mind. Here’s a detail from the larger picture above. 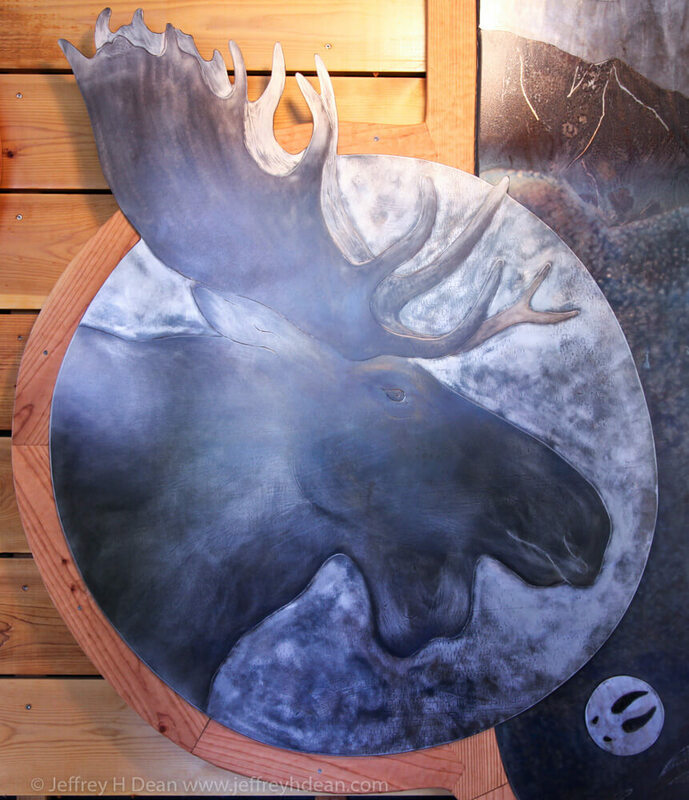 This piece is a 13.5′ wide x 9.5′ high, percent for art commission made for the new Kesugi Ken Interpretive Center in Denali State Park. If you’re traveling the Parks Hwy, be sure to stop in to see it. It’s just north of the Denali Viewpoint South at mile 135.4. 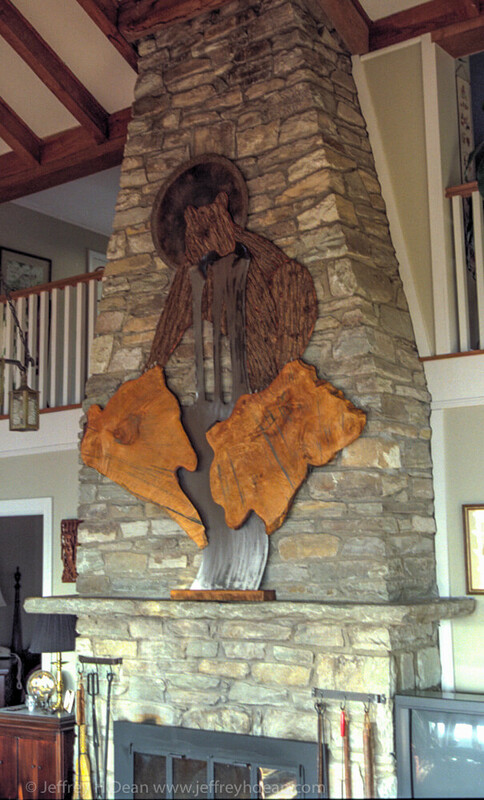 This large carving stands 7.5′ tall and was made from a 36″ diameter, white spruce log for a collector in Fairbanks. Some designs look great in a variety of settings. 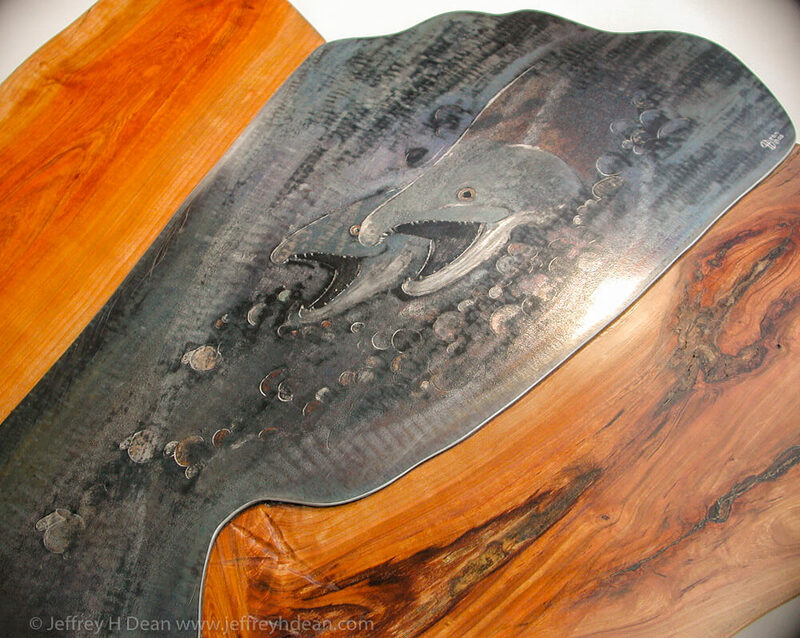 This engraved steel and wood wall piece could also be made as a table top. 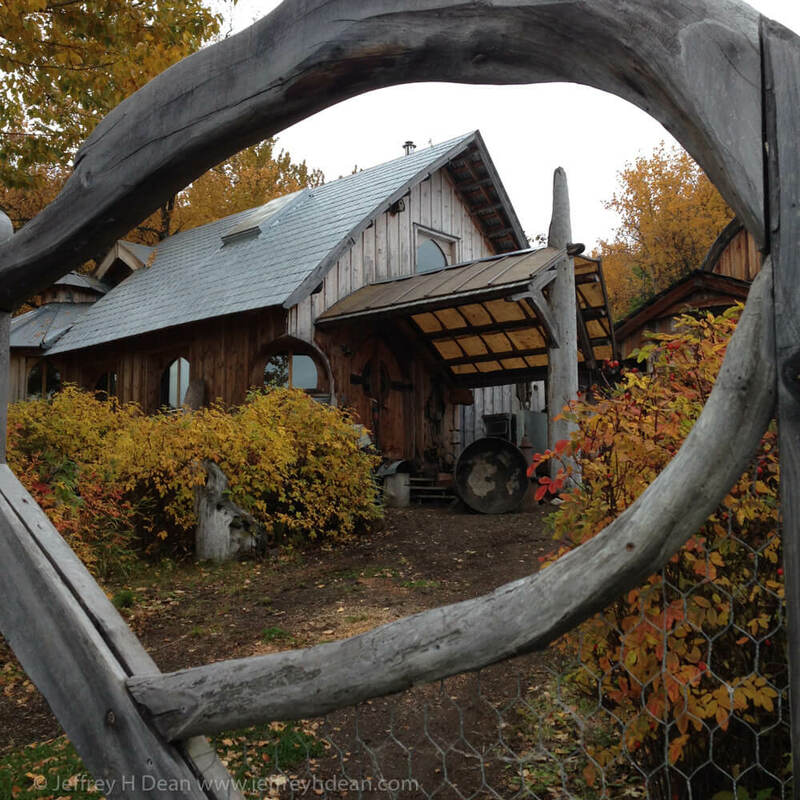 When I was asked to carve this eagle as a final for a 24″ octagon post, the log and timber frame house was already under construction with the post standing in place. 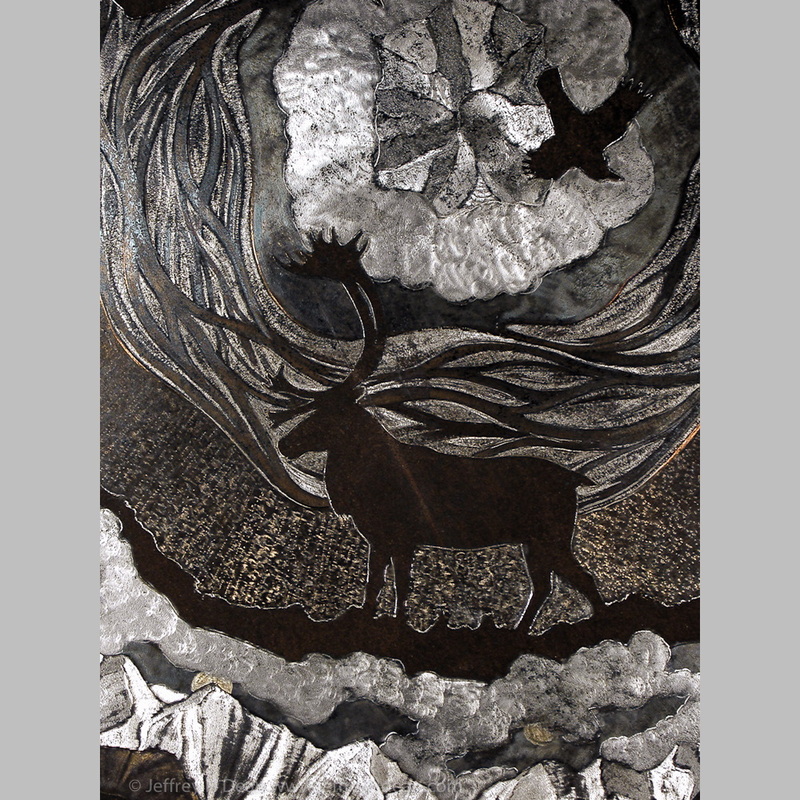 Here’s another example of a limited edition, layered steel engraving. These can be made in a size best suited to your space. With these pieces, the grinding patterns and colorful heat tints combine for a dynamic visual effect which changes with the lighting and your viewpoint. 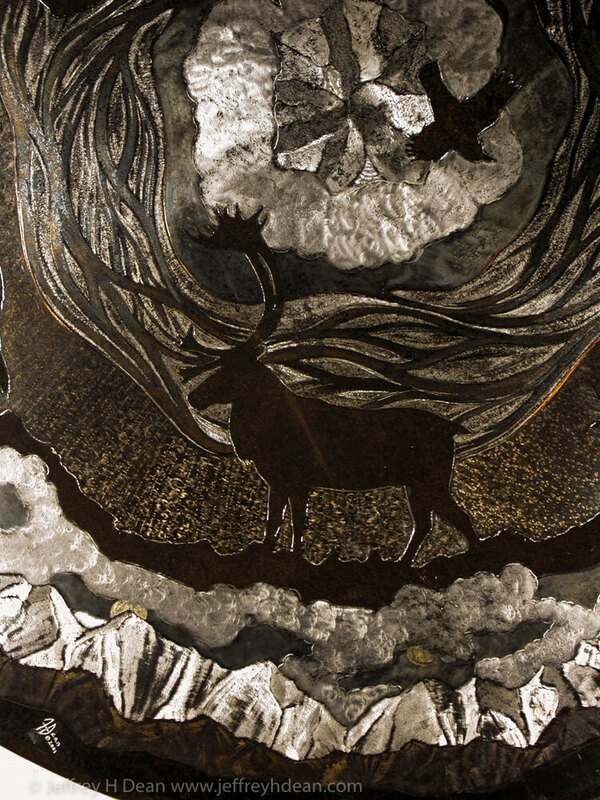 This coffee table depicts the mountains and animals of Denali National Park in engraved steel. 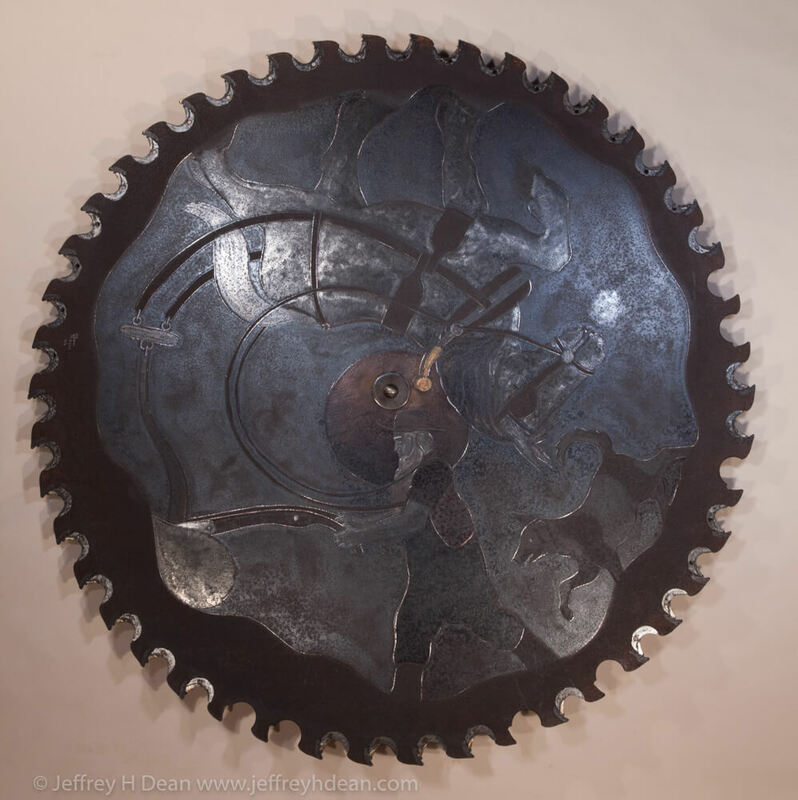 The central disc can be rotated to provide various orientations of the circular design for each viewer. 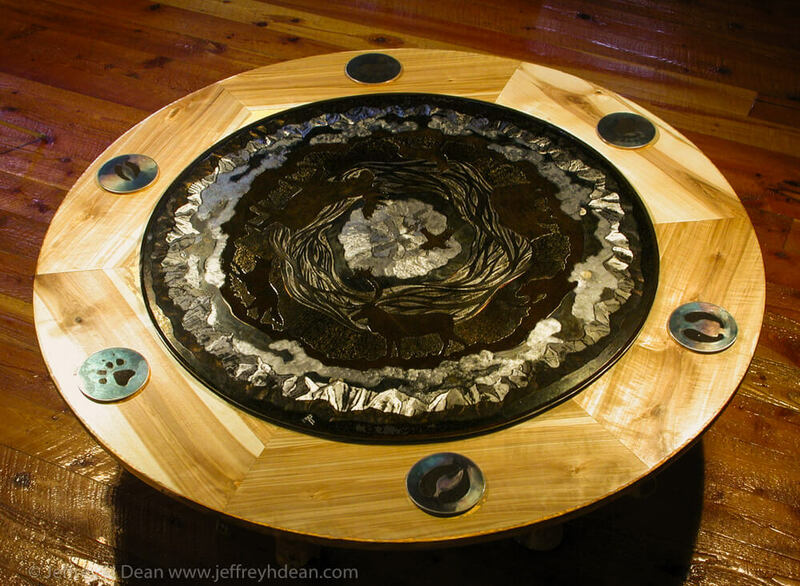 Tables can be made in both symmetrical and natural shapes from many different materials. 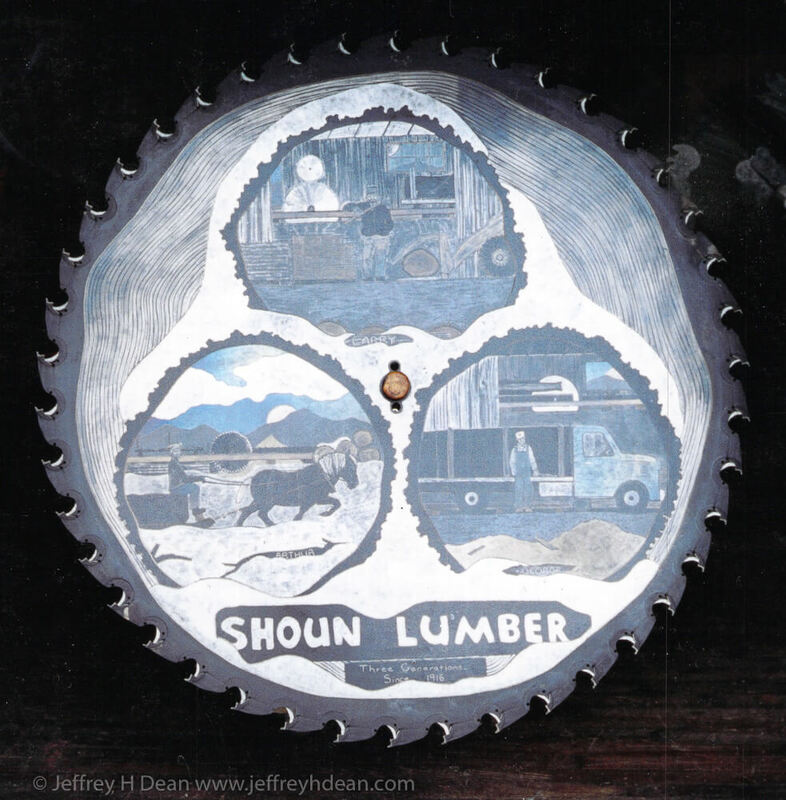 This recent commission for an Inn in Homer is another example of a limited edition, engraved steel wall piece. It can be made in a variety of sizes and would also lend itself to a layered version. Some are made with specific materials in mind. 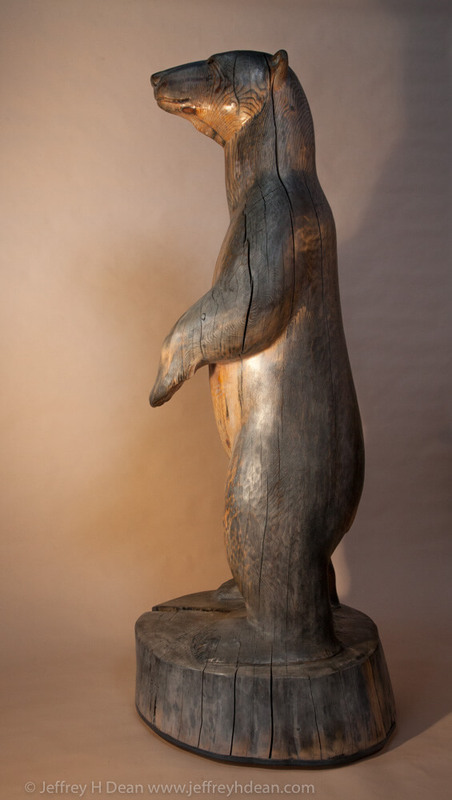 This wall piece was designed around a couple of maple slabs and uses wormy chestnut bark shingles that were leftover from the house’s siding, to make the texture on the bear. 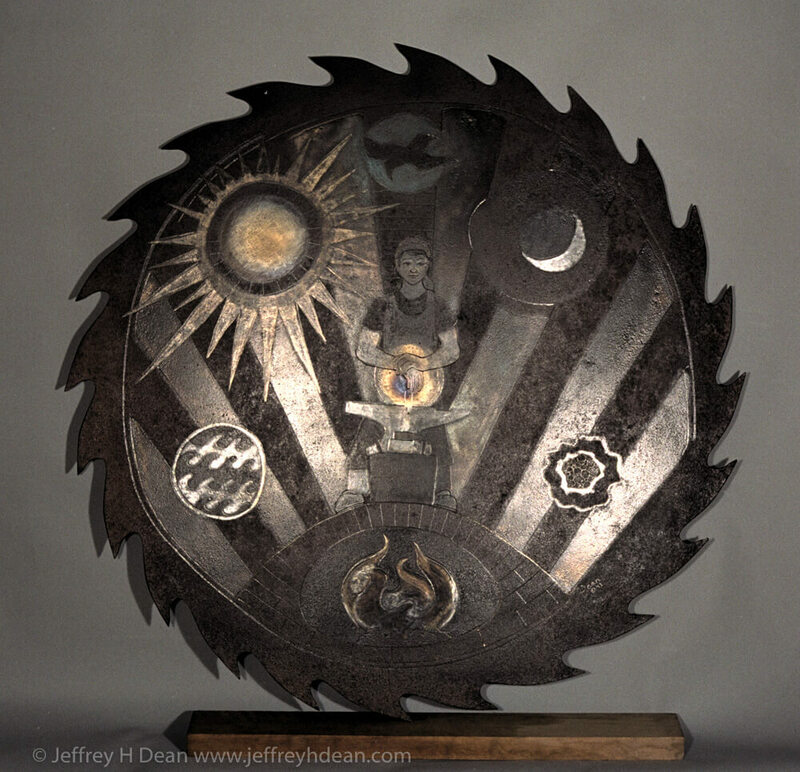 As with many of my existing designs, this layered steel and wood relief is one of a limited edition which can be custom made in a size to fit your space. 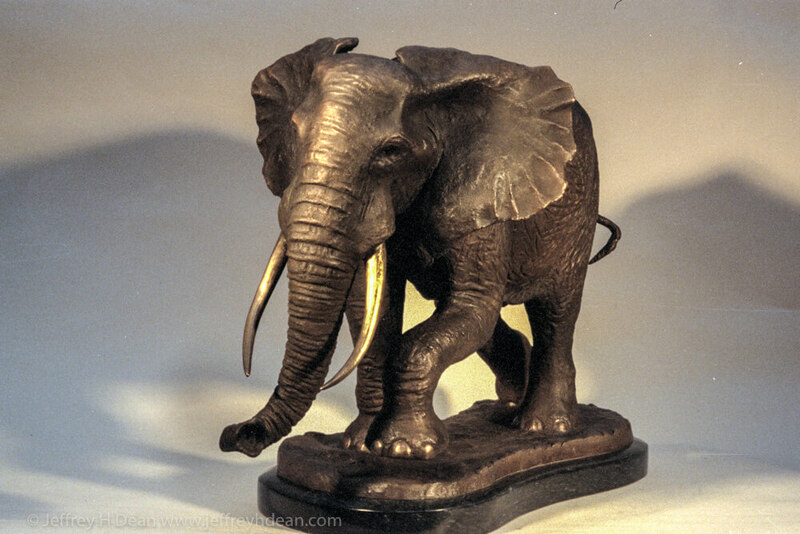 Reliefs can be made as carvings or castings in a variety of materials and on many scales. 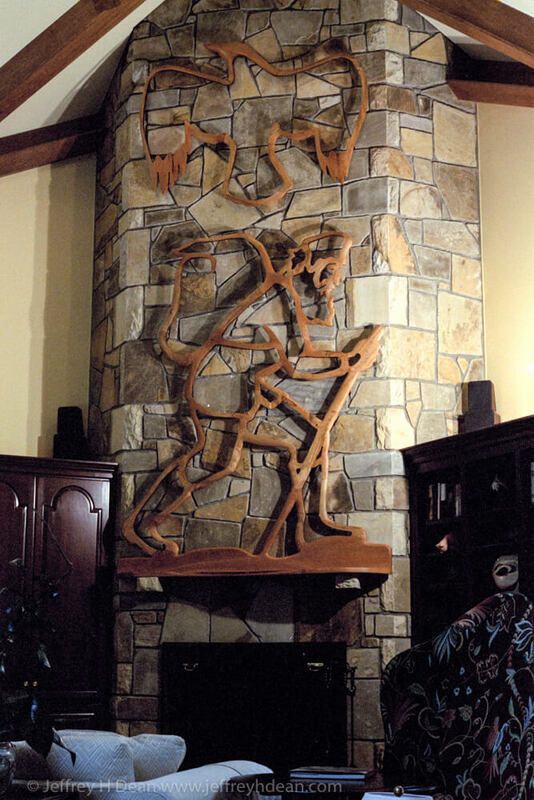 They can be stand alone pieces or used to enhance the character of existing architecture, doors, wood stoves etc. 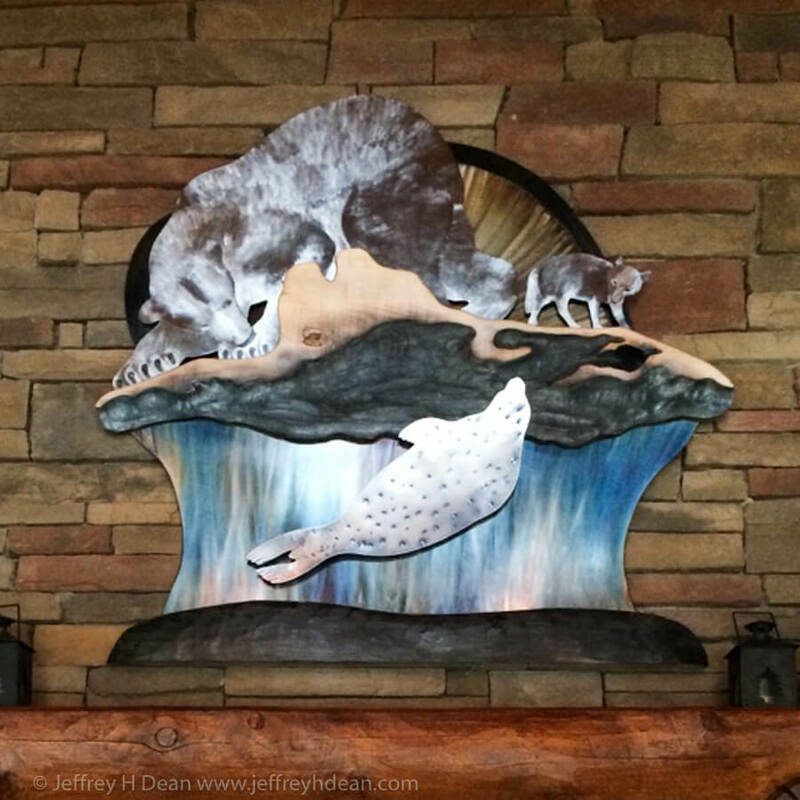 This decorative coffee table was made for Bear Trail Lodge in the Bristol Bay area of Alaska. The clients chose the design for the top from four different designs. 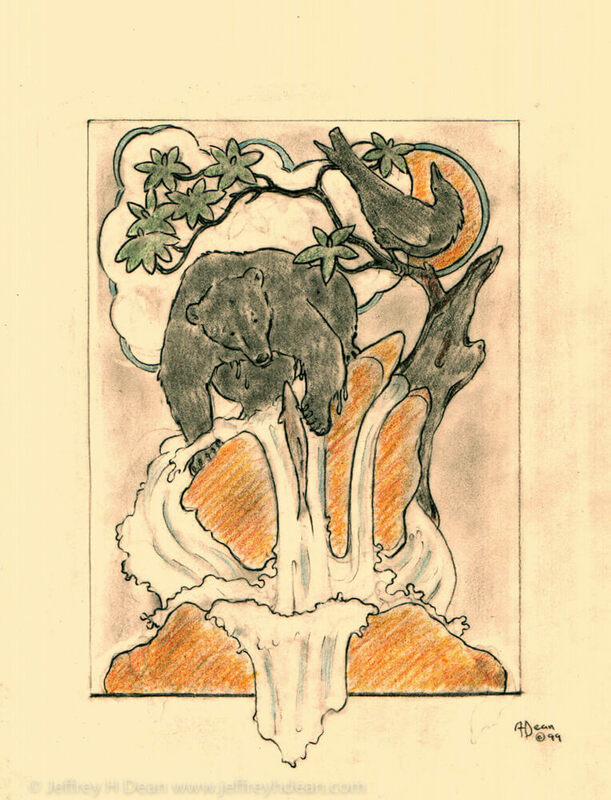 The original title, ‘Daydreams along the Naknek’ was changed to ‘Bear Trails and Tall Tales’ as it was particularly fitting for the lodge. 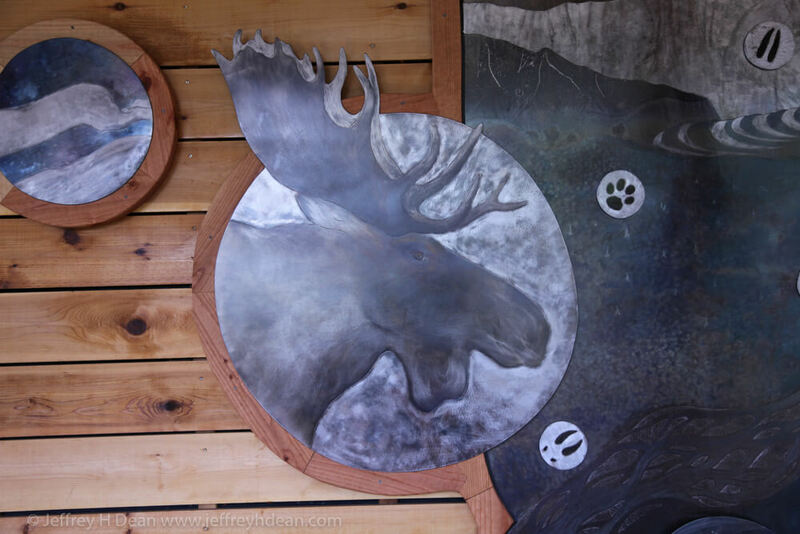 Wall pieces can be made either as a single layer or in multiple layers. 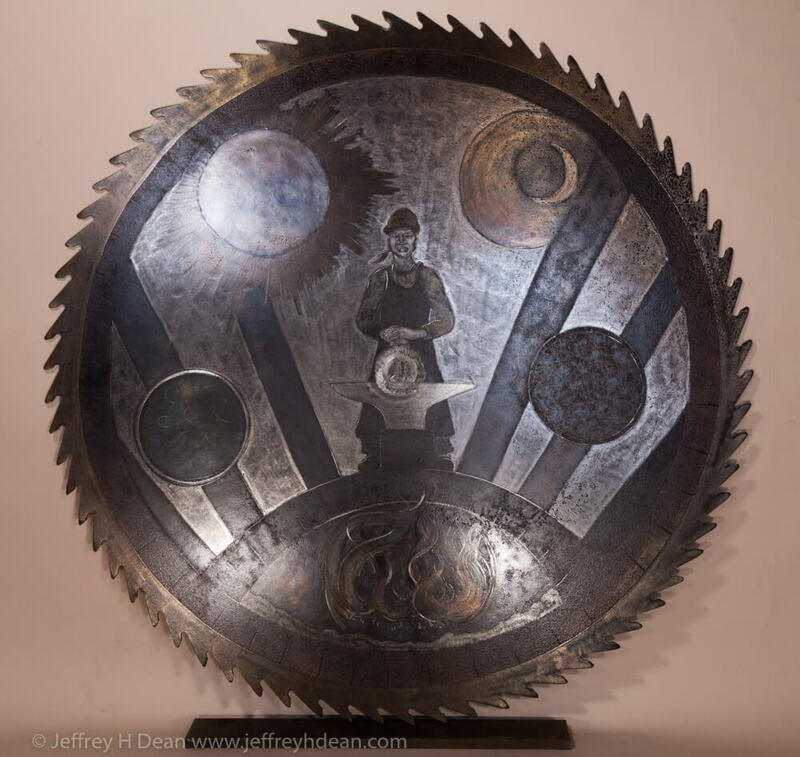 This 5′ wide, single layer, piece of steel wall art was first designed around a 13.5′ long, double curved and forked cherry board. This will go behind the salmon stream. Another large cherry board will be behind the bear. I still have these boards and am waiting for just the right setting to make them into an impressive layered version. This project was done before I used computers and digital cameras. I made a full-size rubbing of the masonry wall which was used to create the patterns. 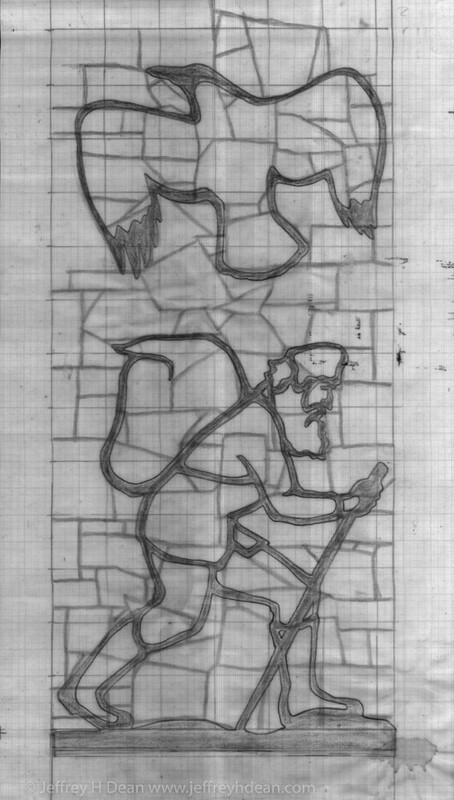 The design was drawn to follow the shapes in the rockwork in a scaled down version of the rubbing. Some designs can take a long time to come to fruition. I had to come up with his particular design overnight, and happily, it came together quite spontaneously. Coming up with designs is usually a progressive evolution, going through several iterations before I’ve got what I’m after. 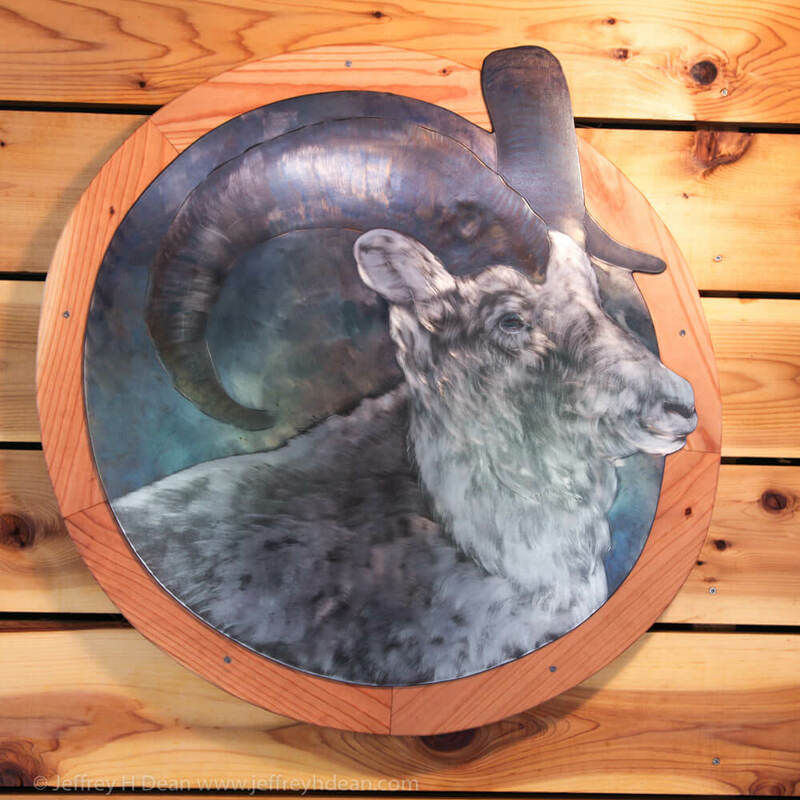 You can see how this design evolved at Through Your Spotting Scope. 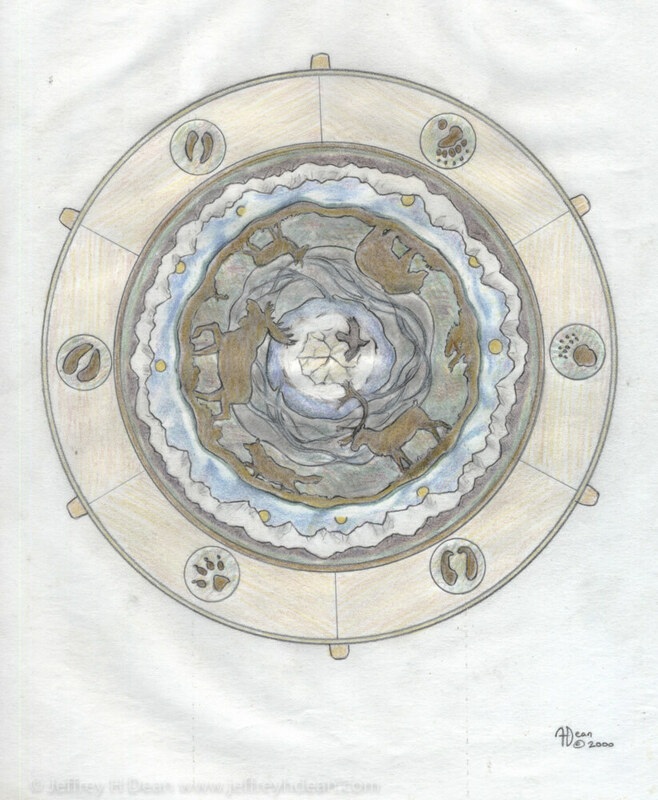 I like adding reference to the seasons and earth’s elements and cycles to designs. 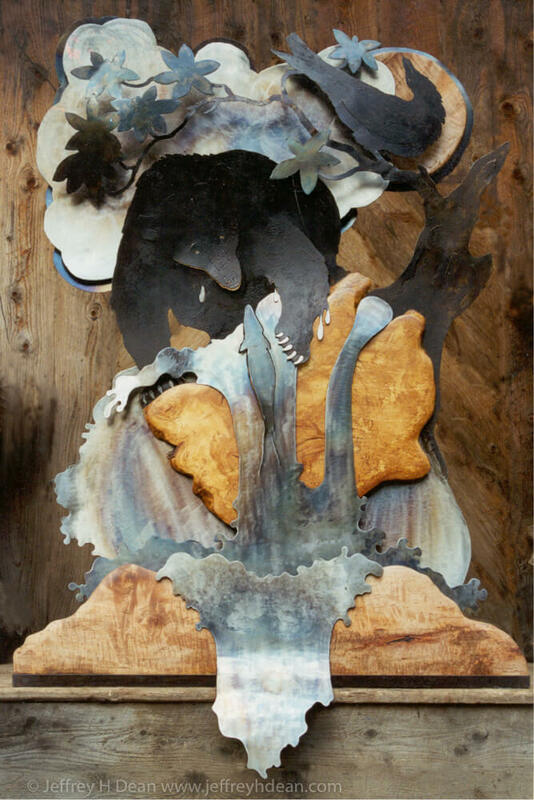 This gives me a chance to combine more abstract design elements with the naturalistic ones. 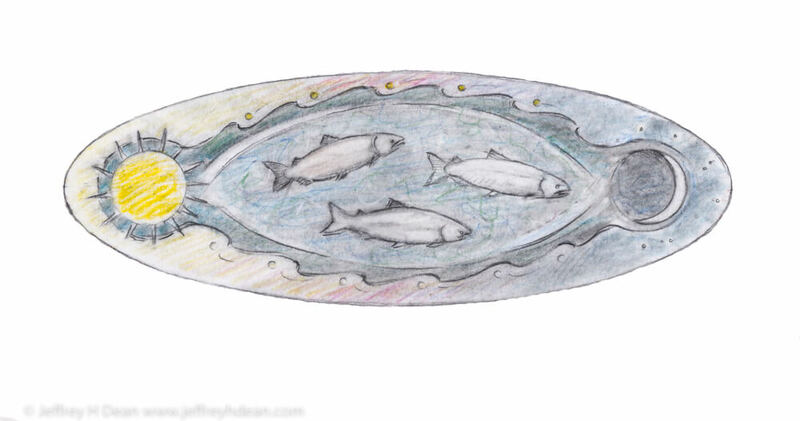 This design, made for Central Peninsula Hospital, is a variation of one made for a table top in 2003. 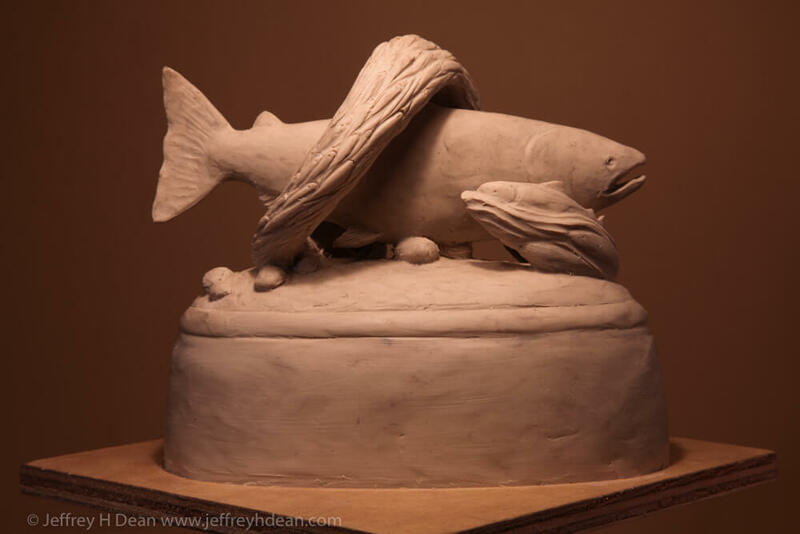 It depicts the life cycle in a salmon stream. For three-dimensional pieces, I make a small clay model to work out the forms and present the concepts. I enjoy incorporating story in my work. It offers an added dimension of interaction, drawing the viewer into a deeper participation and affinity with the artwork. 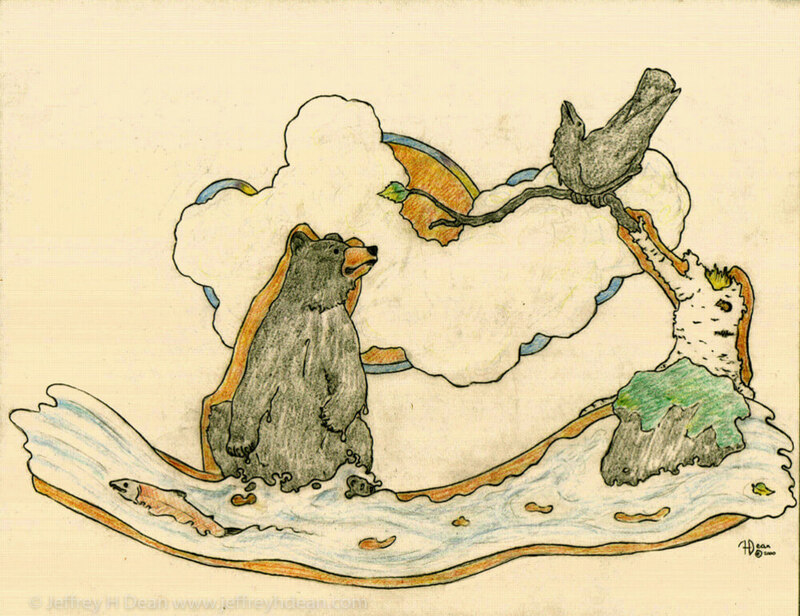 A thankful salmon slips stealthily upstream as a fishing black bear is distracted by a thoughtful raven. 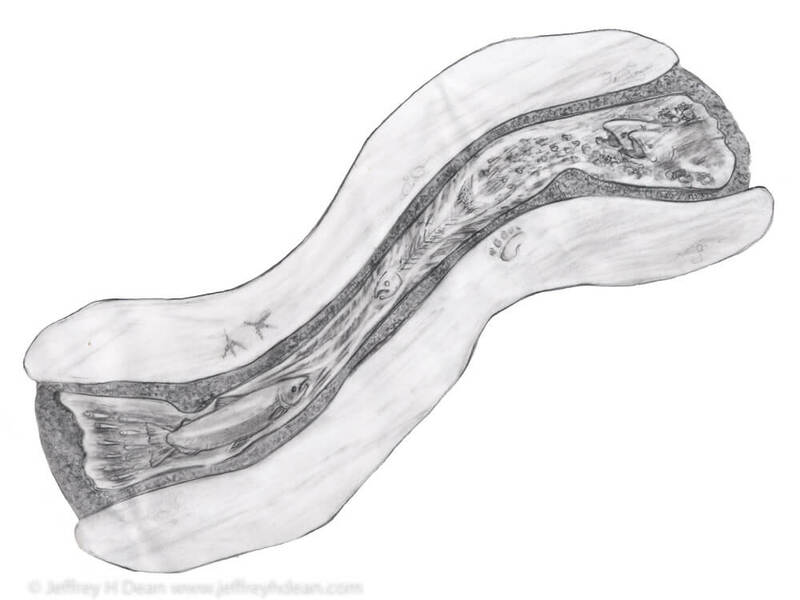 My initial sketch will give you a sense of how your finished piece will look. Tables lend themselves to circular designs which can be viewed from different places in the room. 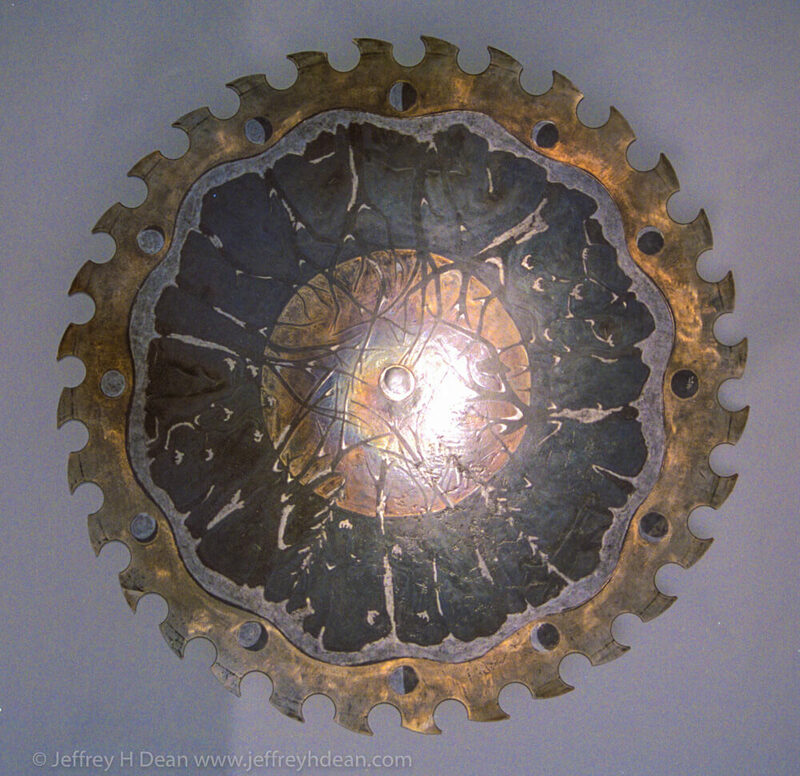 I’ve also made many circular designs on large diameter sawmill blades. 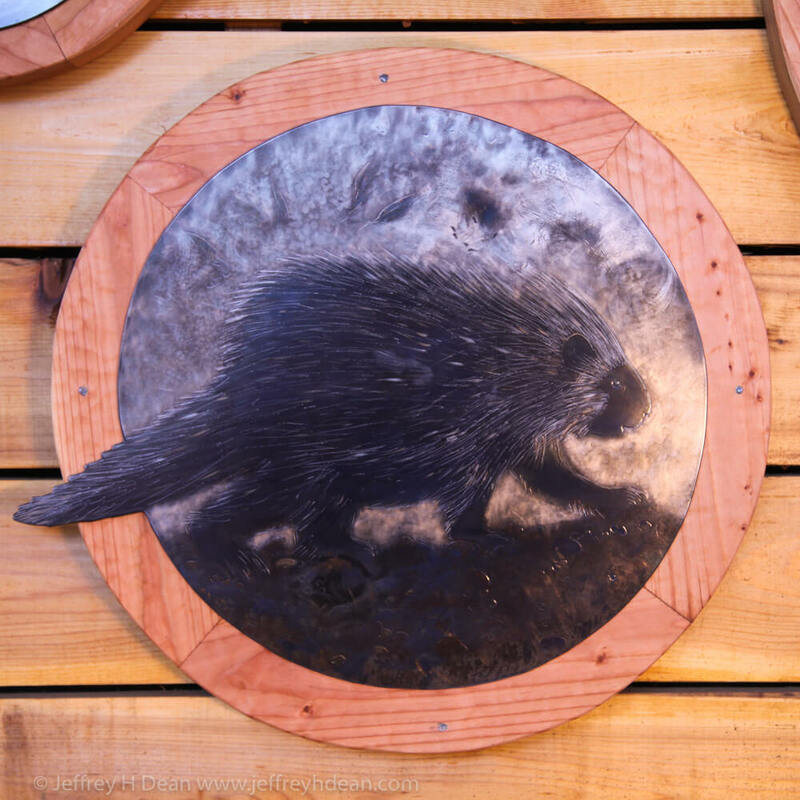 These can hang on a wall or over a mantle and be rotated on their hangers. 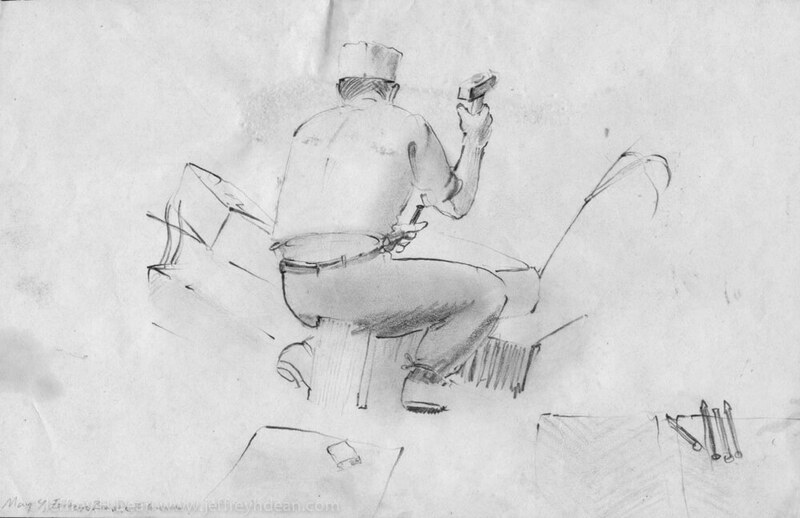 A drawing from one of my travel sketchbooks. One of my favorite things about making custom artwork for people is when the ideas and dreams you have for your home or business come together synergistically with my experience and artistic sensibility. This results in something totally new; something neither of us could have imagined on our own. 1. The first thing to do is get together, share ideas and discuss different possibilities. We can do this on the phone, or in person at your place, or at my studio in Homer. 2. 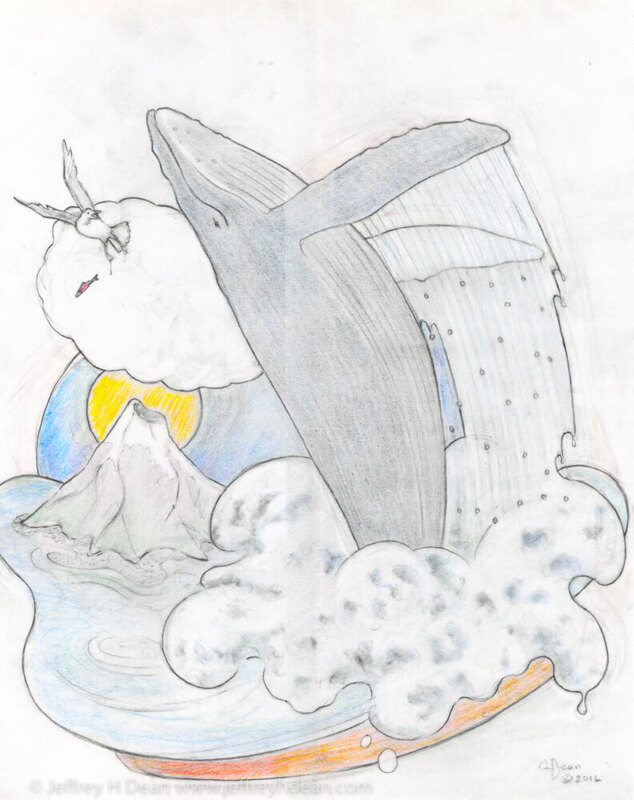 Once we’ve got a direction to go in, I’ll work on a drawing or drawings for your review. With a design approved and formalities taken care of, it’s time for me to begin creating your artwork. 3. They say the journey’s as important as the destination and you, your guests, and your friends will be able to follow along with my progress while your artwork is created. You can Like my Facebook page or Follow me on Instagram, to see regular updates and process photos from Creative Fires Studio. If you don’t use social media, I’m happy to send pictures and updates by email. 4. Depending on the scope of your project, and my current commission schedule, you could be enjoying your new artwork in as little as few weeks. Once it’s delivered and installed, you can begin to enjoy your new investment and share it with your friends and guests. 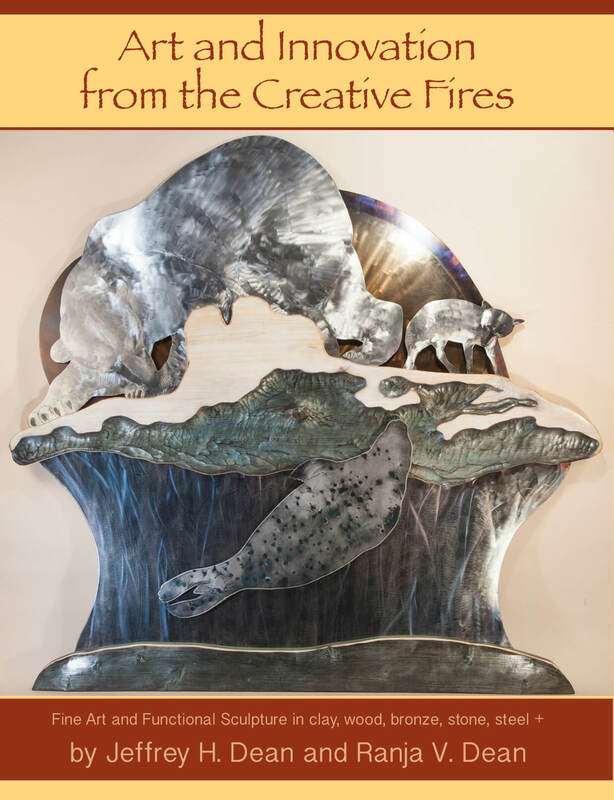 When your artwork is finished, I’ll send you a complimentary copy of “Art and Innovation from the Creative Fires” and feature it on the cover. 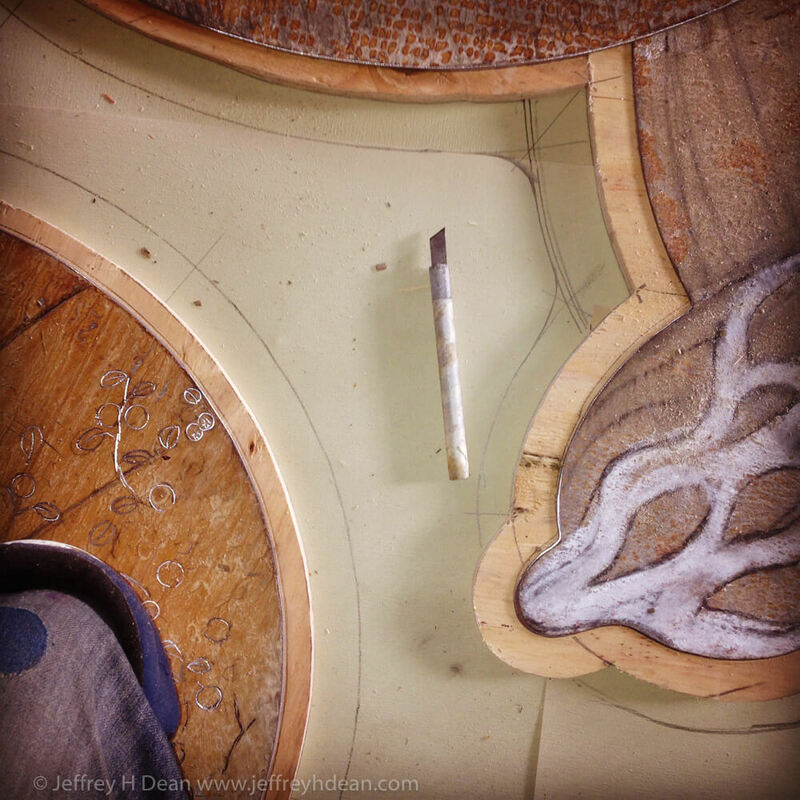 I’ll also include a section on how your piece was made. I met Jeff at Art in the Park in Blowing Rock. 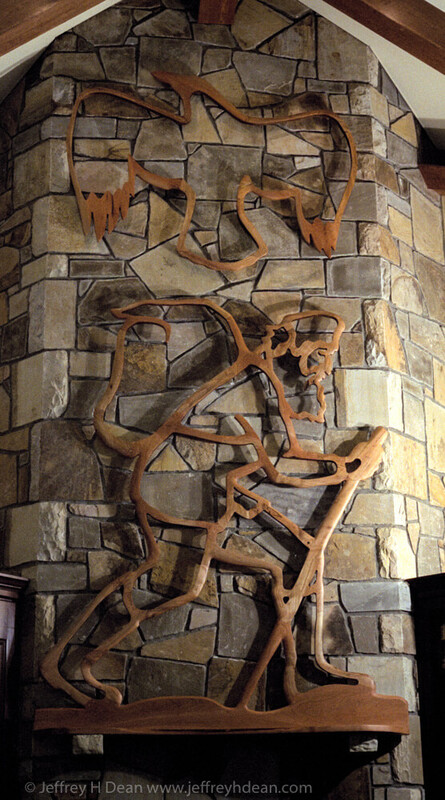 He had an impressive portfolio, and as I'd recently built a new home in Linville, I asked him to design a wall sculpture for the tall stone fireplace. He came by the house, and after discussing themes and commenting on the beautiful masonry job, he came up with a design that complimented the stone work rather than hiding it. It is a beautiful piece and was a special part of the house. I enjoyed it for many years, and now, 20 plus years later, the family that currently owns the house comments on it often. It's extravagantly beautiful workmanship. It was a pleasure working with Jeff. He presented ideas and thoughts, and was helpful with suggestions. 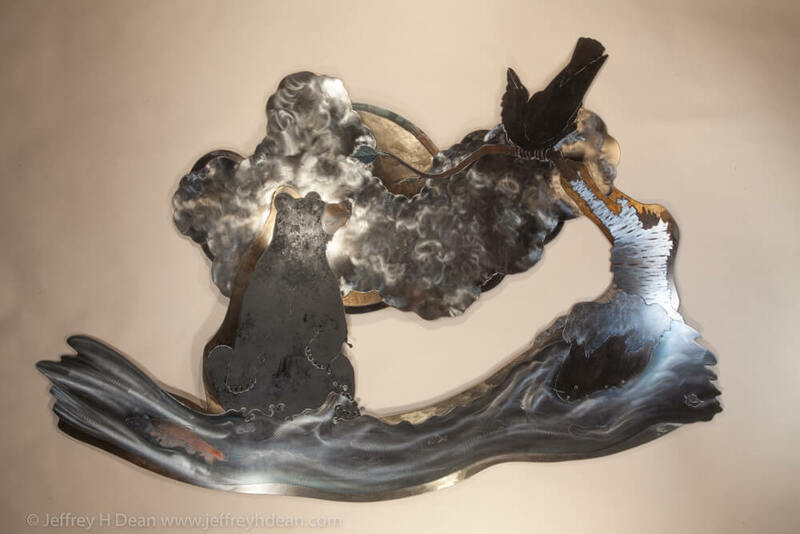 My family and I have enjoyed the beautiful creativity of Jeff Dean's artistic production in our home for nearly 20 years. 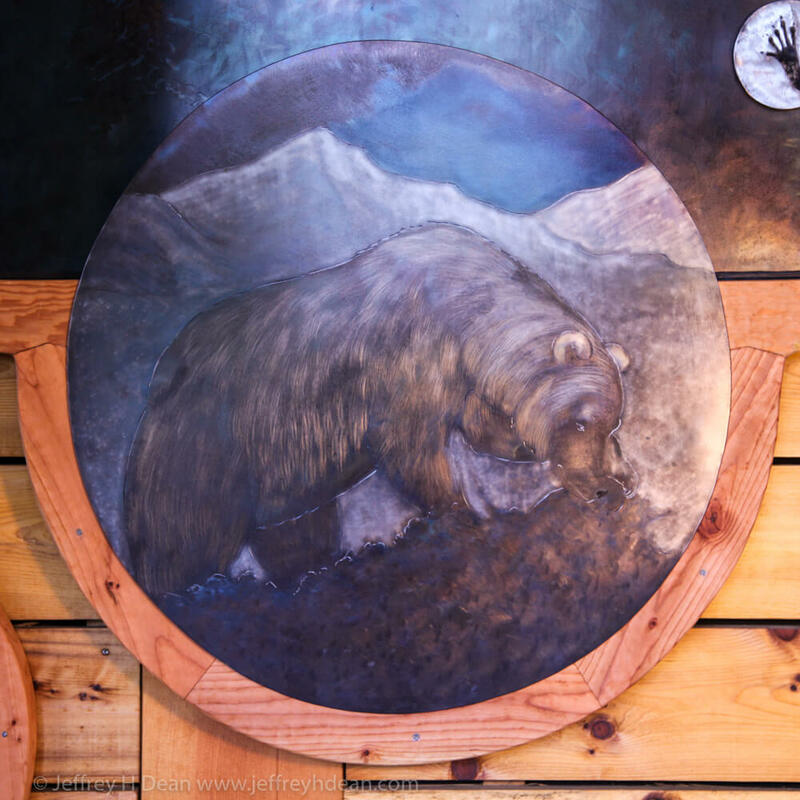 This has been in the form of the "Denali Table" which depicts various Alaskan wildlife pictured on iron set over a gorgeous wood table with metal coasters set around the table's periphery depicting the "foot prints" of all the pictured wildlife. This piece has been the topic of so many joyful conversations and memories and truly has forged lifetime memories for so many. I value this piece more than any other work of art in our home. 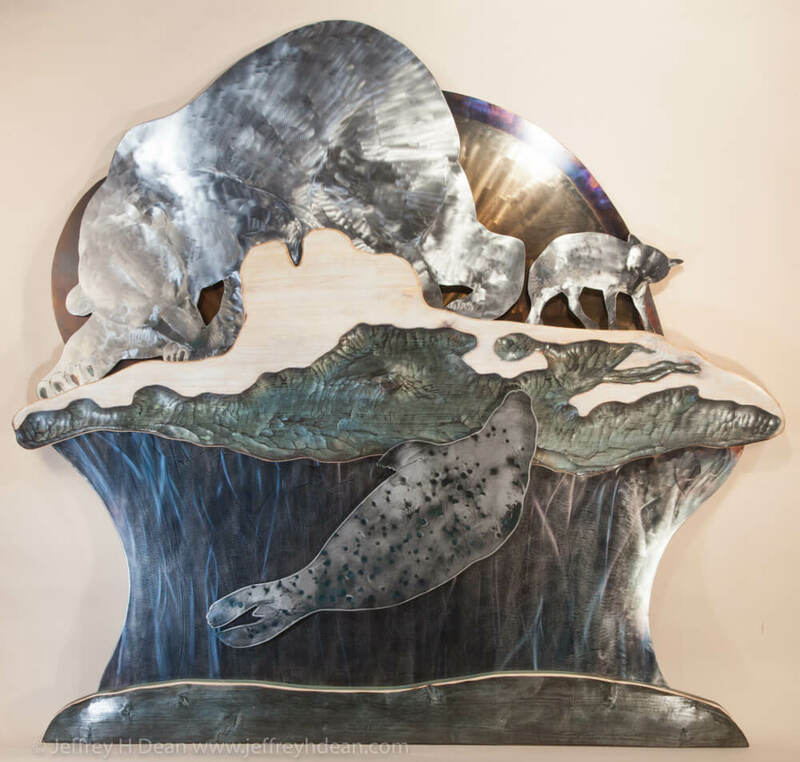 My family and I have come to treasure this work not only for its beauty but for what it has evolved over time to represent in our Alaskan home. Thank you so much Jeff for sharing your gift with all of us! 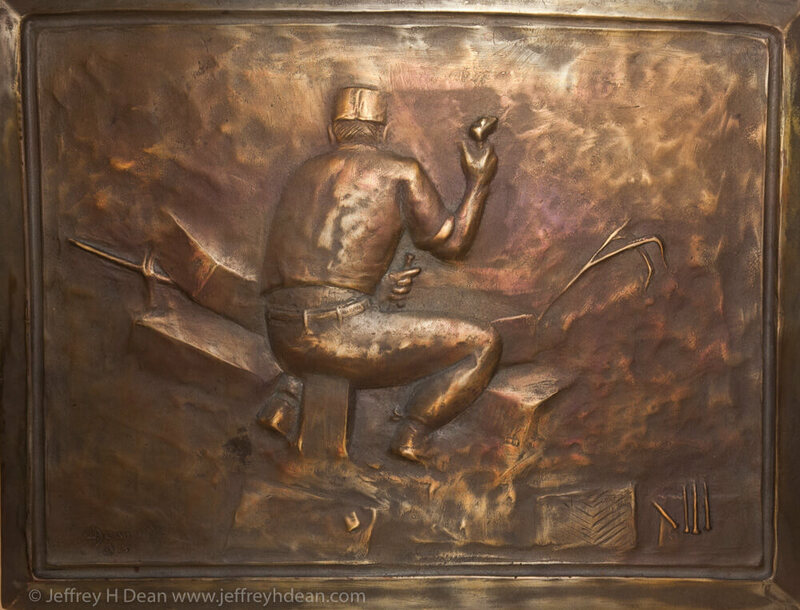 We commissioned Jeff Dean and Creative Fires studio to create a sculpture for our entryway. Jeff sat down and discussed the possibilities with us. 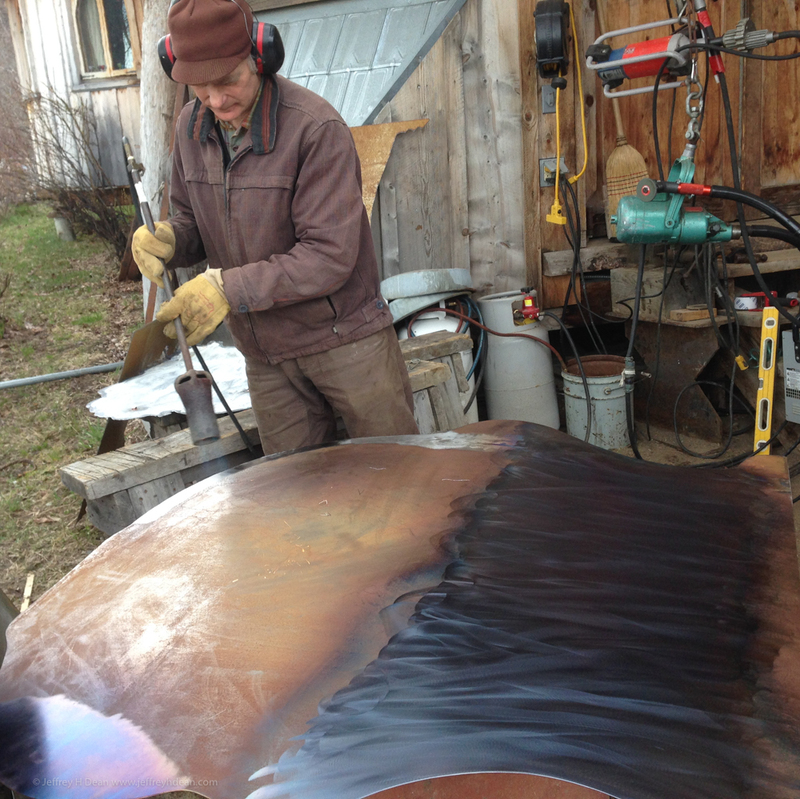 We decided to have him create “At the breathing hole” to be done with a combination of wood and steel. We can’t believe how wonderful it turned out. The sculpture was better than we imagined it would be. Jeff sent us pictures throughout the process so we could “watch” it being created and also invited us to his workshop to see the progress. We highly recommend Jeff for any work you wish done. His talent and creativity are amazing and we are extremely pleased with the work he has done for us. I receive more pleasure from your two magnificent bronze portraits of my beloved dogs than from all my other art combined. You captured their likenesses and their spirits perfectly and forever. Thank you. We were starting a new business and moving into a new building. I had not thought about a sign and was recommended to contact Mr. Dean. He came out, looked over the building and asked about our requirements. He quickly prepared a conceptual proposal that was accepted. 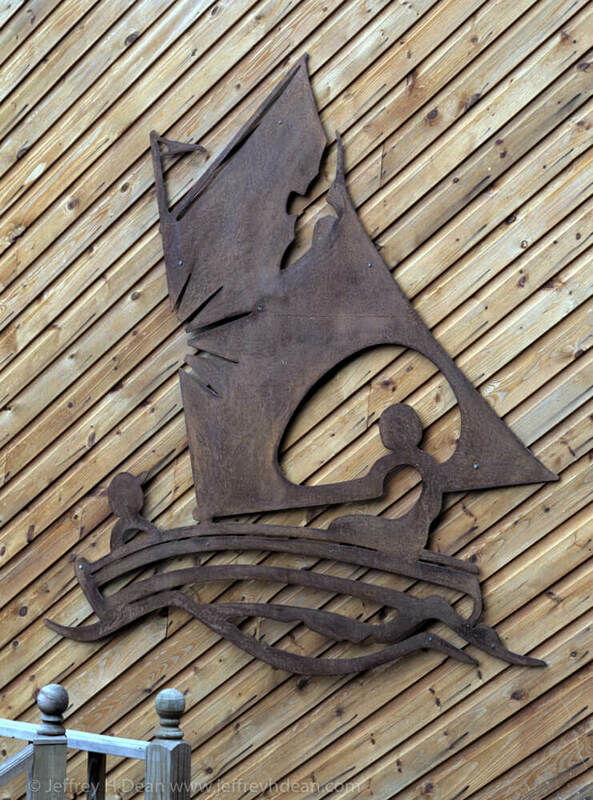 His design for our sign was nicely adapted to the space available, incorporated design elements from the building, was produced with lasting materials, and gave us a beautiful statement for our business. I would highly recommend him for artwork that is creative, adapts to the surroundings, and makes a pronouncement about the concepts he is trying to bring forward. My name is Pam Nickell and I am a Project Manager for Aesthetics, Inc, an arts consulting firm in San Diego. We commission and purchase art for hospitals and medical centers. 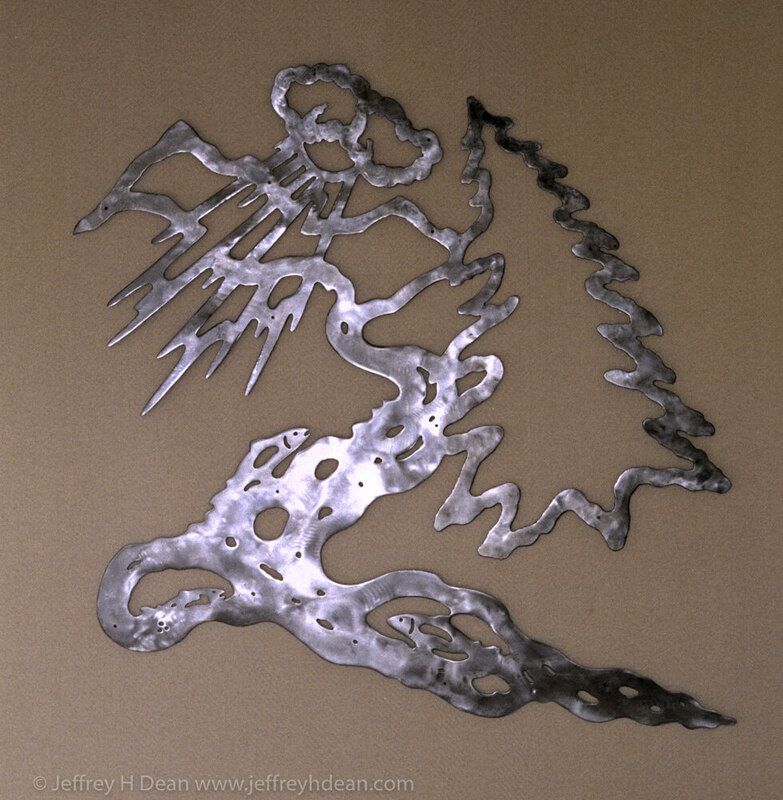 I am writing to recommend artist Jeffrey Dean to you. 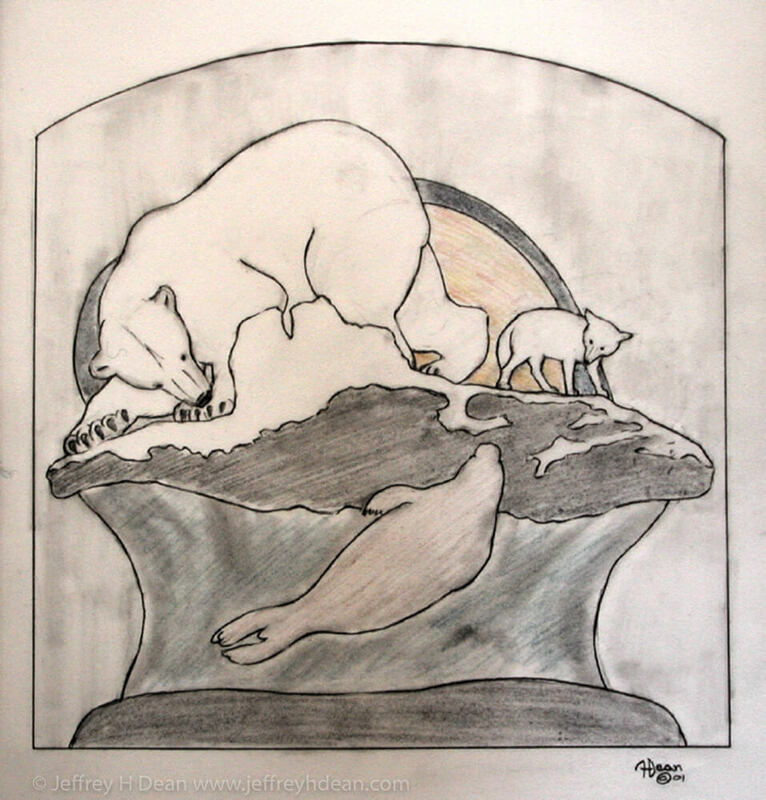 I have had the opportunity to work with Jeffrey on an art project at Central Peninsula Hospital in Soldotna, Alaska. 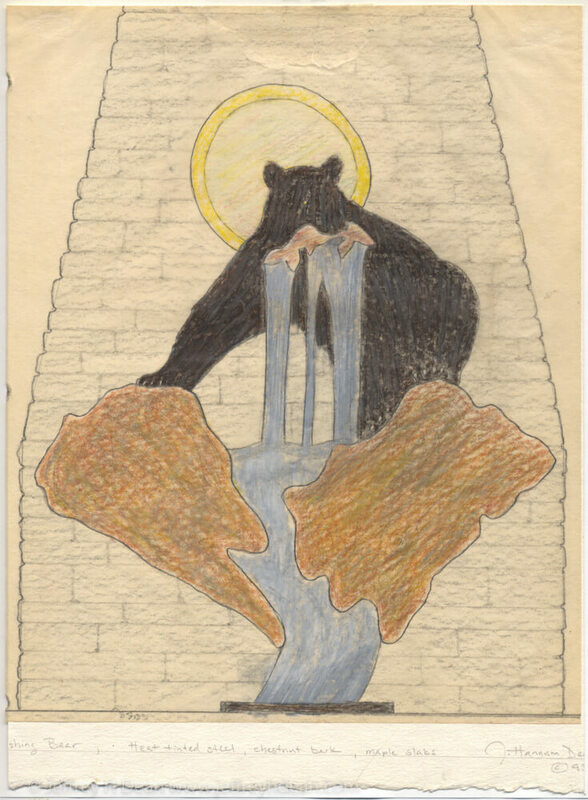 He had applied for this project through a call for art process and was selected out of 50 artists to produce a concept design as well as a final product for the hospital. 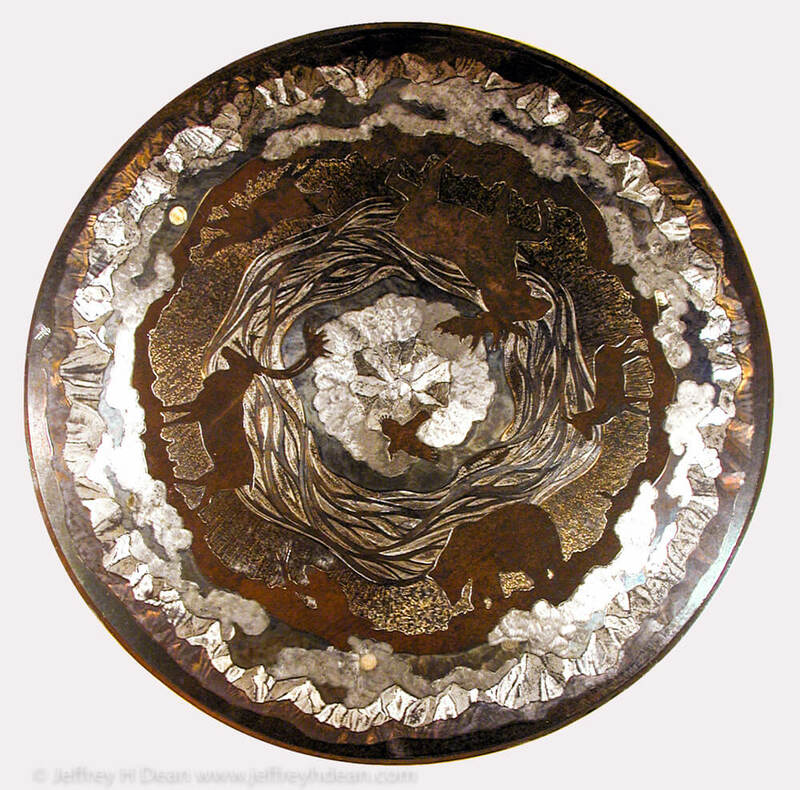 Jeffrey has the unique ability to work in several different mediums effectively. His proposals for artwork have been informative, on budget and completed on time. 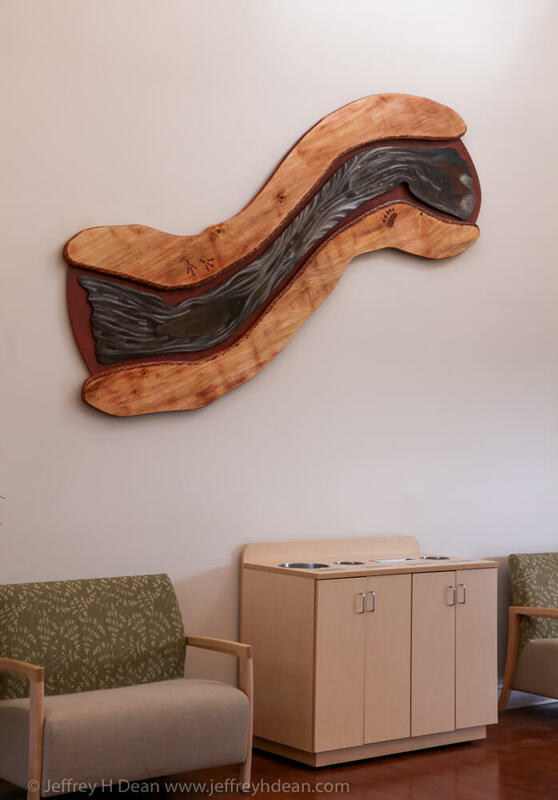 Aesthetics, Inc. and Central Peninsula Hospital is very pleased with the beautifully unique wall sculpture that he created for them. 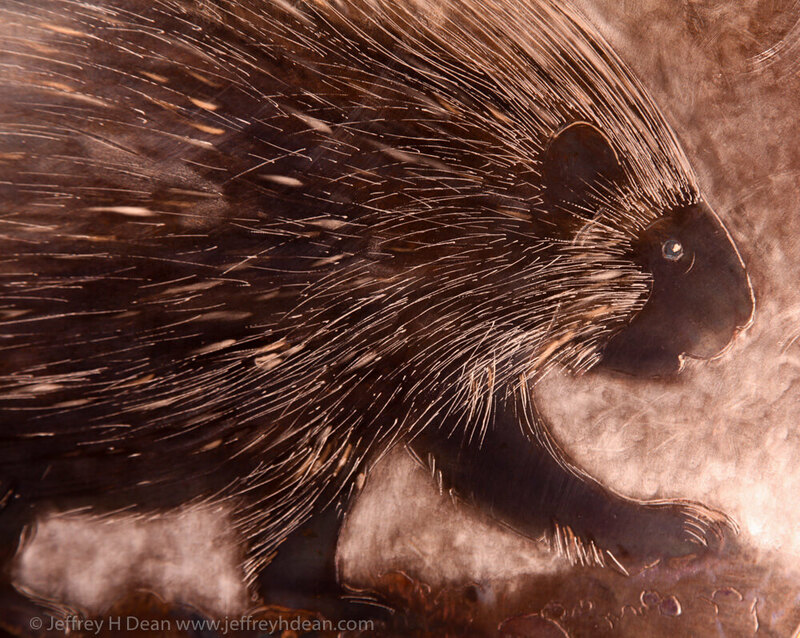 I would highly recommend Jeffrey for corporate, public, and healthcare settings. 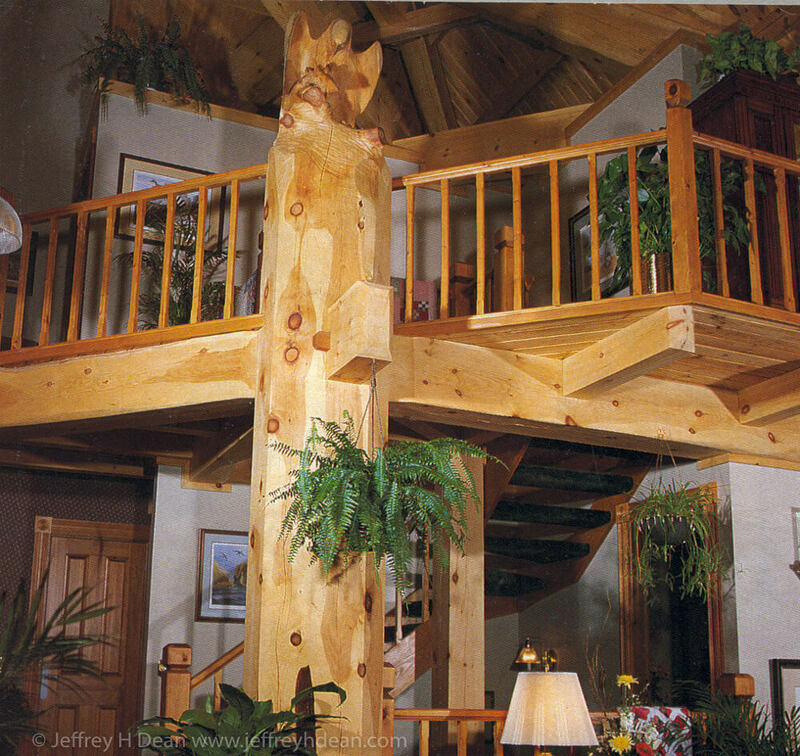 We were the very proud owners of the eagle carving that Jeff (we called him Hannum back then) did on the center support log of our hand-built log home in Knoxville, TN. When the house was built the log was a lot taller than it finally ended up and looked totally out of balance with the rest of the log structure. In fact, it detracted from the open design and was kind of overpowering. We knew it was meant to be a focal point but weren’t sure exactly what to do to make it what we wanted. I don’t remember just how we met Hannum, I think it was at a show of some kind. Whatever it was, we immediately knew that this guy could make something special out of our log. He came to see what we had to work with and completely charmed us with his vision. Jeff wasn’t very well known at that time and all our friends thought we were out of our minds to let this unknown person take a chainsaw into the middle of our wonderful new house and just let him “go at it”. We never had a doubt. I forget how long it took, but it was a terrific experience to watch him bring that log to life and not a day went by that we didn’t admire our eagle. It was perfect. It still is. When the time came for us to sell that home the new owners told us it was the eagle that sealed the deal for them. It gives us great pleasure to know that eagle will be admired there for many generations. 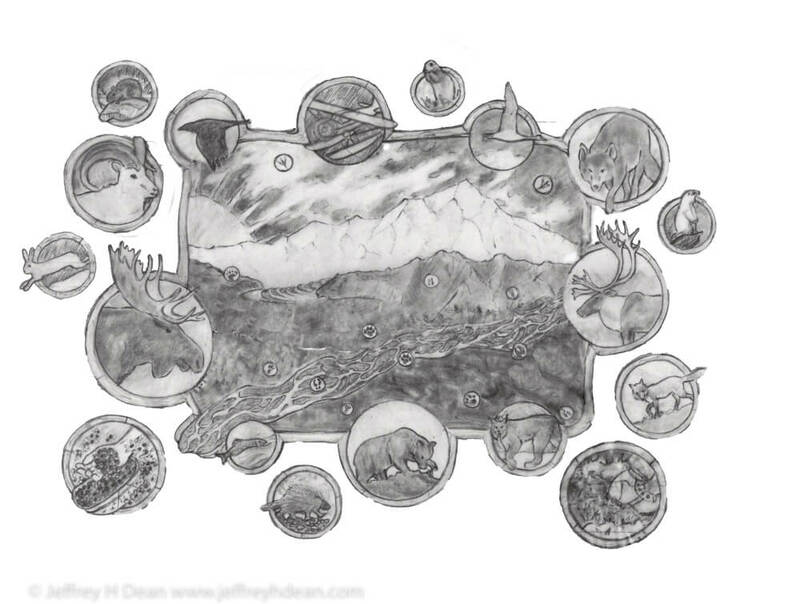 Jeff Dean was a pleasure to work with and provided an exceptional piece of artwork months ahead of schedule. His website was used to provide real-time updates, detailing every step of the process. 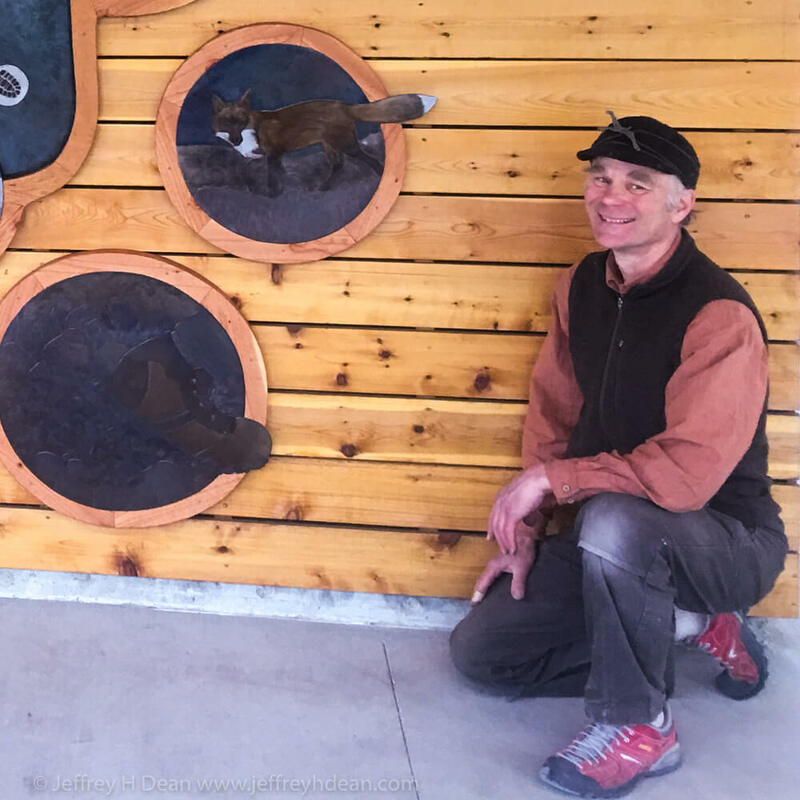 I was most impressed with his ability to collaborate with the client and design artwork which synergized with the vision and purpose of the Interpretive Center facility. He exceeded the expectations of all involved in the project. As you’ve absorbed all this, you may have had a few flashes of inspiration, or you may have decided to leave that up to me. You may feel you need to look around your place to get a sense of whether there’s a possible fit for my work or run it by your partner. You may just have a few unanswered questions. We can discuss the ideas I come up with and I’ll make a sketch or model for your review. Once it’s refined and approved I’ll use it as a reference for creating your artwork. There are many factors that weigh in on how much any artwork may cost. These include the size and complexity of the design, material and style choices and delivery or installation considerations. The current values of the examples presented on this page range from $1400 – $42,000. With this in mind, I’ve gotten very good at finding elegant solutions to meet the requirements of most budgets. Thanks for taking a look. With no obligation on your part, I welcome the opportunity to explore the possibilities with you.